Your own Beach House just became affordable. Have you ever dreamed of owning your own beach house, but time, maintenance or money are stopping you from reaching your dream? Now you can have access to your very own, absolute beach front house for a whole year with absolutely no maintenance or cleaning required! 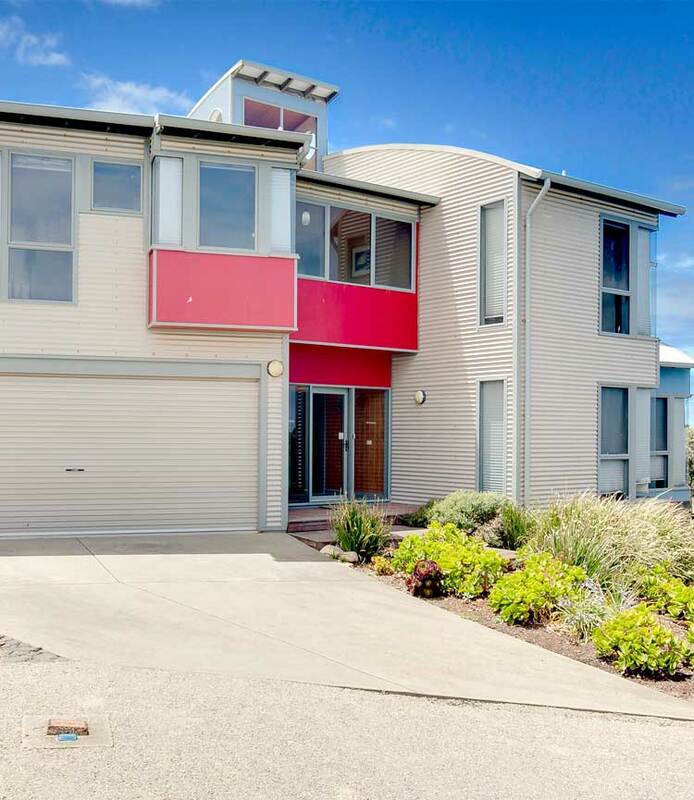 Phillip Island Waterfront House is launching “My Beach House”, allowing you to become a member and enjoy our beautiful beach house for you and your friends and family. My Beach House membership allows you to book up to three full weeks and 5 x three-day weekends of your choice. That’s 36 nights at our amazing beach house that you can enjoy without worrying about the maintenance or bills that come with owning a house. What kind of beach house? 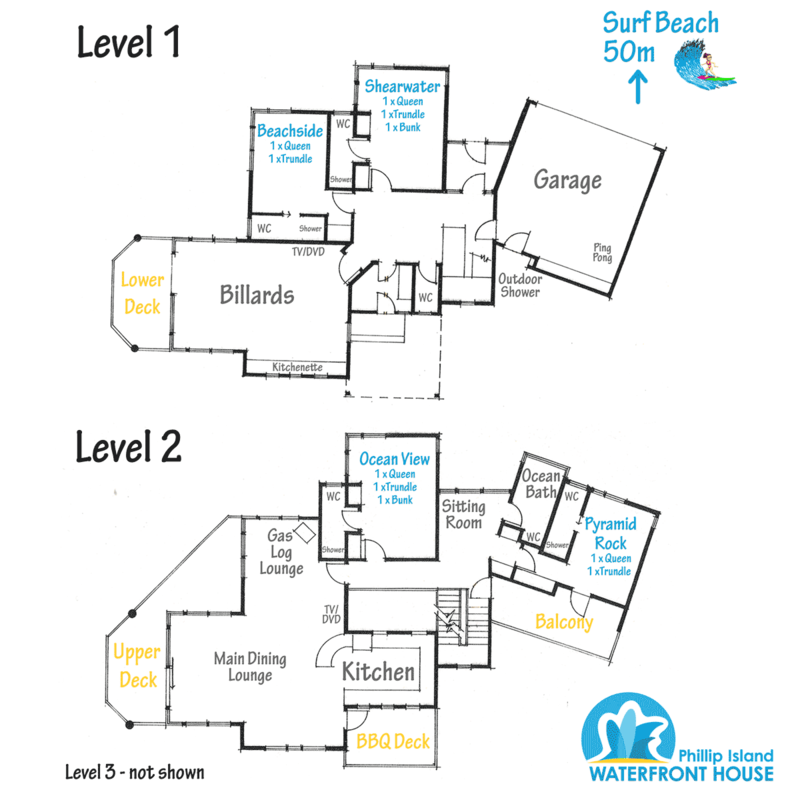 An absolutely amazing three storey, four bedroom, six bathroom luxury house with 270 degree stunning Ocean & Bay views. Our absolute beachfront house includes a billiard room, loads of living spaces and can sleep up to 16 guests. A fantastic surf beach is right on the doorstep, walk down with your boards and meander back for a hot outdoor shower. 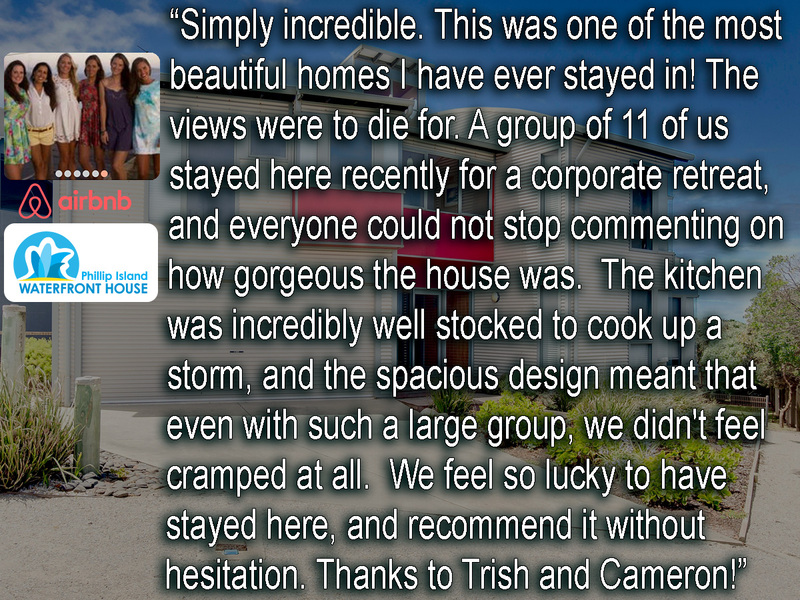 Also included is free Wifi and Netflix, making the house completely family friendly! 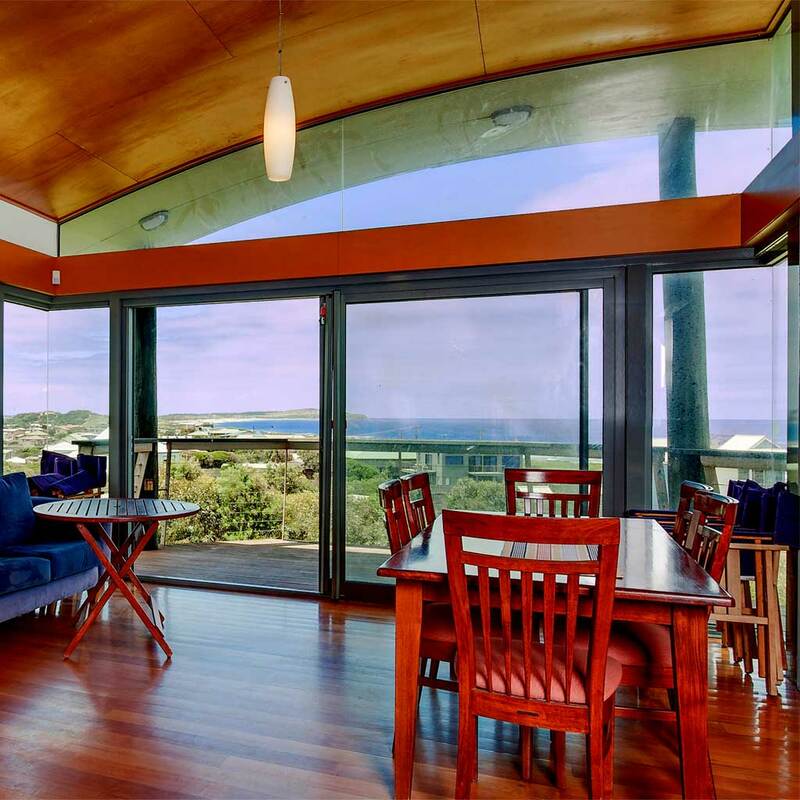 Phillip Island Waterfront House opens this membership for the first time ever which is strictly capped at 4 members. Come and visit our house for an inspection by appointment. As a member you will receive priority bookings valued at a fraction of the retail price. Please note this is only offered to Phillip Island Waterfront House Facebook Friends, past guests or referrals only. Huge upstairs living area with stunning 270 degree water views. Includes large TV, Bluray internet enabled DVD player, Stereo (with Blue Tooth) and quality couches. Relaxing gas log fire (with remote) with ocean views. Free NBN WiFi Internet and Apple TV. Large kitchen with two ovens, dishwasher and generously-sized refrigerator. Two large dining tables catering for 14 people plus. Large balconies around the property giving stunning water views. Includes gas BBQ and outdoor setting. Downstairs Billiard Room comprising of a kitchenette with bar fridges, stereo, TV and DVD player. Commercial size washing machine and dryer. Ensuite bathrooms in each bedroom. Electric panel heaters in every room and split system cooling and heating in the upstairs living area. Garage parking for two cars and fold away table tennis plus four additional car spaces in driveway. Ideal for motorcycle or drive day events! Pyramid Rock Room: 1 x Queen & 1 x trundle. Beachside Room: 1 x Queen & 1 x trundle. Over $16,000 of bookings for only $9,999! 3 x 7 day weeks during the year (Check in Fri, Check out Fri). Notes: – Includes upto 10 guests in the price with no extra charge. Additional guests $25 person per night upto 16. Email us at info@phillipislandhouse.com.au to register your interest. Please state your guests ages and a little bit about yourself and how you found out about this offer . Please review our Terms & Conditions (download here). If you are successful we require a signed copy of the Terms and Conditions along with a copy of your drivers license and a $900 deposit (which will become your bond) to confirm your acceptance. Bookings are made via a ballot system based on your preferred dates.